I’d sit cross-legged upon the floor, and against parental admonitions, position myself very close to the television. My favorite segment was what followed the exercise, when the lights were dimmed, and reflective music wafted in the background. Richard would peer into the camera and speak directly into our living rooms. My heart swelled with admiration when he would say that he knew there was a healthier and happier person within each one of us. His demeanor was so compassionate, and his words, empathetic. To me, he might as well have been clairvoyant – and quite possibly, a Saint. This show resonated deeply within me. And despite family’s efforts to dissuade, I simply couldn’t divert my misty, mesmerized eyes from that screen. I suffered an injury during this time, which lead me to have surgery with many weeks of physical therapy. The therapist explained that I needed to discontinue certain activities, but graciously suggested an alternative avenue for my physical competitiveness – Bodybuilding and Figure Shows. This I did pursue, and after much work and hard knocks, I eventually captured local, state, and national titles. I settled into a career that encompassed three worlds – rehabilitation, fitness, and inspirational coaching. It seems like pure Providence to be able to combine interests that feel so natural to me. For this bliss, I’m grateful. My business operates in the form of a private practice which involves a diverse array of physical modalities, consulting, and motivational speaking. And whenever possible, I embrace opportunities for community outreach. Oh, inspiration can be a mysterious matter. But, perhaps if we attune our eyes to see and our ears to hear, we may then bear witness to this wondrous whirling world. Surely, we shall then wave our arms, jump and shout for the amazing grace, which is all about! And as it goes with all of us, the culmination of our life experiences are actually the production of us in the making. 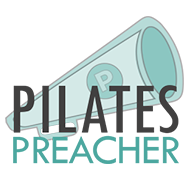 So meet Laura Burdo / The Pilates Preacher, and I aspire to inspire you! INSPIRATION TO PERSPIRATION From The Inside Out!